The best tire inflator gauge is small enough to take anywhere, robust enough to handle high and low tire pressures alike, and versatile enough for easy, accurate use. No garage or shop is complete without a good air compressor and the accessories that go with it, including air wrenches, ratchets, and tire inflation tools. Look for a tire inflator with gauge that includes a quick change chuck, allowing you to quickly go from inflating a car tire to blowing up the kids’ pool without having to make any complicated changes. Combine this with a top rated air hose to get the best results. Topping the list, the Milton S506 has almost everything you could ask for in tire pump. 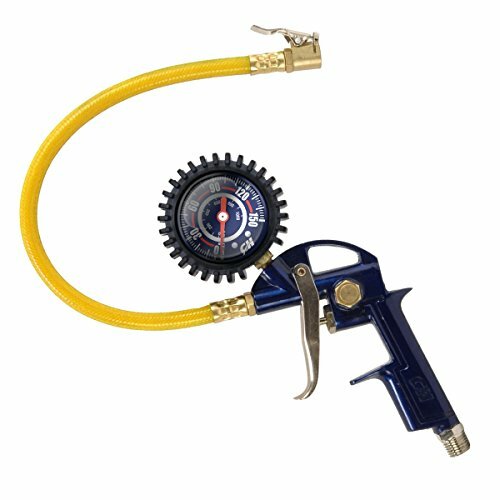 It features a magnified inline, bubble lens gauge, dual head valve stem adapter, and convenient 12 inch mini-hose to make it easier for you to position the inflator. For many of us, this is the tool which comes to mind we think of a tire inflator, and being made in the USA (with some imported components) is a great indicator that it is made to meet or exceed specifications. While this model is a bit dated, it remains extremely popular mainly due to its build quality and ease of use. Unlike its competitors, you can easily get 10+ years of use out of the Milton. One thing you need to be aware of with the Milton S506 is that it is not a good tire inflator for most ATVs. Balloon tires on typical all terrain vehicles are under 10 psi, and this unit has a range beginning at 10 psi and going up to 120psi. Even though the unit still performs as well as any similar tool on the market, the design is beginning to be a little outdated, such as the omission of a pressure release lever, which has become fairly common on tools of this type. The first few times you use this model, check the pressure reading against another tire gauge until you are comfortable with the accuracy or deviance of your Miltion model. 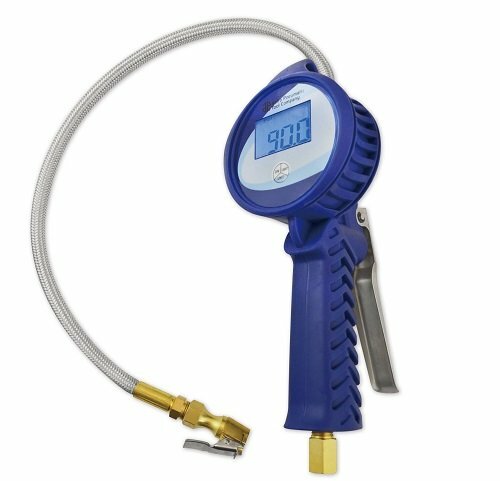 The Astro Pneumatic digital tire inflator has one feature that is not found on most models of this tool, a digital gauge that displays readings in more than one format, including psi, kg, and BAR. This model has a deflator lever that allows you to drain excessive air pressure, and the quick change chuck makes it convenient for use in most shop and garage environments. 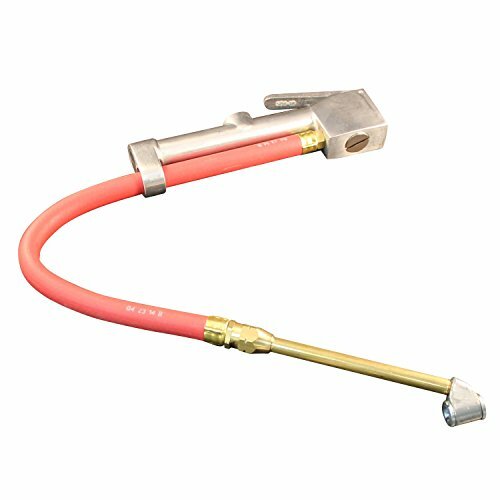 It comes with a 21 inch mini hose, and a locking valve stem connector to free up one hand during use. This model works well with ordinary compressed air, nitrogen or other inflation gases. As far as bad points go, the two things you need to watch out for are a potentially short battery life and a case design that makes the inflator vulnerable to heavy duty usage. 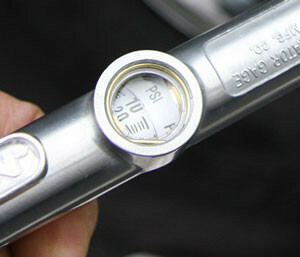 The MP6000 uses a convenient dial gauge with markings for both psi and kg. The handy gun design makes inflating or deflating tire a snap, and the clipon valve adapter means you can use your hand for something other than holding a piece of rubber pipe. While not intended to be a heavy duty model to be used in commercial settings where durability and high accuracy are required, it’s a good cheap tire inflator for home use. The biggest complaint with the MP6000 is that the chuck does not always seat properly, which can make it difficult to get an accurate measurement or to precisely set tire pressure.